While the demand for entrepreneurs in the realm of sustainable and innovative food and agriculture is strong, often, new entrepreneurs need guidance. 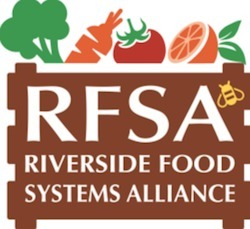 The SCORE Inland Empire chapter is looking to fill this need with free face-to-face business counseling services at the upcoming GrowRIVERSIDE conference, scheduled June 11-13, 2015 in downtown Riverside, California. SCORE, which has chapters all across the United States, uses mentors to guide and coach new and budding entrepreneurs. SCORE mentors draw from a wealth of business experience to guide and advise new businesspeople. SCORE will engage with GrowRIVERSIDE for the first time this year. Thomas Evans, an Inland Empire SCORE mentor from Riverside, serves on the board of directors of a local water agency. It was through his connections there that he learned of GrowRIVERSIDE, and later he was able to connect SCORE to GrowRIVERSIDE. “It’s very gratifying, helping people with their problems and issues,” says Bob Henry, a Riverside-based SCORE mentor who joined the organization nine years ago. Even though SCORE’s focus is broader than food and agriculture-related endeavors, its experts know about business, research and financing. They bring their expertise to all businesses, including ones focused on sustainable agriculture. 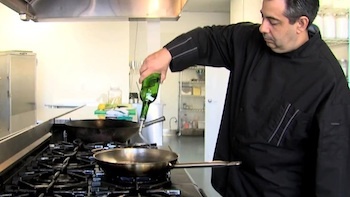 The Cooking Block in Redlands is an example of an Inland Empire business that has benefited from SCORE’s expertise. It was this recognized Truth that led Schrader to seek out mentorship from SCORE. He knew he had a great business model of a commercial kitchen rental, but still needed advice. His first meeting with a SCORE counselor was in December 2012. Largely because of the shepherding from SCORE counselors, The Cooking Block is now up-and-running. It’s a 3,400-square foot facility that rents commercial kitchens for weddings, parties and special events and offers gourmet cooking classes taught by experienced chefs. Initially, Schrader met with SCORE counselors locally and virtually through “email” mentoring. Startups or established businesses looking for free, confidential counseling can take advantage of the services of over 30 volunteer counselors affiliated with the Inland Empire SCORE chapter, all with hands-on business experience. More counselors are needed. In the meantime, Henry and other counselors are looking forward to sharing their wisdom one-on-one with attendees at the GrowRIVERSIDE conference. If you’re looking for more information on the 2016 3rd Annual GrowRIVERSIDE Conference: Cultivating the Future on March 21 – 22, you can find out more about the program here and register here! Limited Tix Remain for June 11 Citrus Circle Farm-to-Table Dinner; Reserve your spot now!